"So easy but so delicious." In large pan cook onion and celery in butter or margarine. Add clam chowder, cream of potato soup, cream of celery soup, clams, and half-and-half, and heat through. NOTE: Half-and-half is best but milk will do. 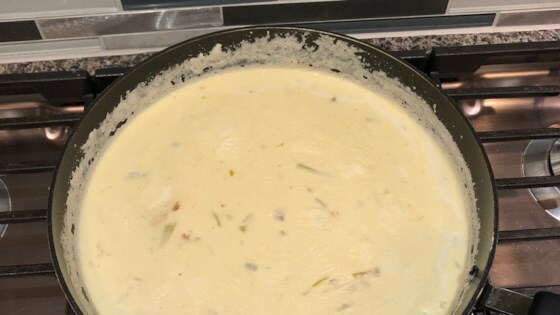 This clam chowder is sooo easy and so delicious! It's our new family favorite! I add partially boiled and cubed potatoes to this recipe for a heartier chowder. Perfect for a fast easy meal. I added 1 can of whole new potatos cut in chunks and a 10oz can of whole baby clams with the juice. Deelish.